It looks like SAUSD School Board candidate Mark McLoughlin has ditched the other two candidates who were also endorsed by the Santa Ana Educators’ Association – Dr. Rigoberto Rodriguez and Dr. Alfonso Alvarez. McLouthlin’s campaign just dropped a mailer that omits any mention of Rodriguez and Alvarez and encourages voters to only vote for McLoughlin. On one page of the mailer McLoughlin goes as far as to show the voters that they should only vote for him! 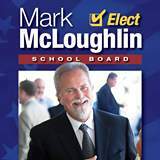 McLoughlin surrounds himself with Latino children in the mailer but this is the same man who worked to recall a previous SAUSD Trustee, Nativo Lopez because Lopez wanted to build a neighborhood school in McLoughlin’s area. And McLoughlin has steadfastly opposed the completion of the Santiago Creek Bike Trail – reportedly because he doesn’t want the city’s youth to bother him and his neighbors by riding their bikes on the trail. McLoughlin also got caught this year trying to use the ballot designation of teacher, until another School Board candidate, Planning Commissioner Bruce Bauer, called him on it and a judge forced McLoughlin to change his bogus campaign designation to “Education Advisor.” He sits on the board of Neighborhood, Inc. and McLoughlin has no formal training in the field of education. He is a businessman. 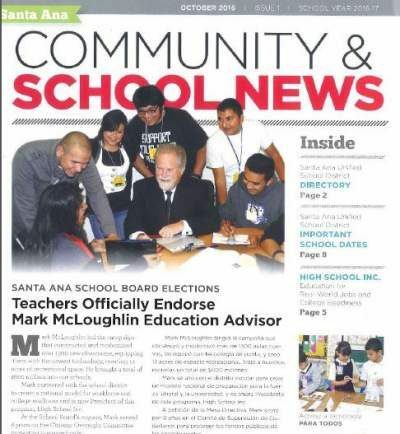 We can see why the teachers’ union endorsed Rodriguez and Alvarez as they are both accomplished teachers and counselors. Why in the world did the teachers back McLoughlin – and will the teachers regret backing him now that he has ditched his fellow candidates? On June 25, 2009, Lopez was charged by the Los Angeles District Attorney’s office with four felonies: fraudulent voter registration, fraudulent document filing, perjury and fraudulent voting. Lopez allegedly leased office space in Boyle Heights and registered to vote using that address although he lived with his family in Orange County. It was further alleged that Lopez, former president of the Mexican American Political Assn., cast an illegal ballot in L.A. in the 2008 presidential primary based on the business domicile he used, but interpreted as disallowed by the L.A. County District Attorney’s office. In a plea deal, Lopez pleaded guilty to one felony count of voter registration fraud related to the voter fraud charges. Lopez was recalled in 2003. Before all that stuff you referenced happened. I am aware of that – this is additional information to confirm that Nativo “Larry” Lopez is a no-goodnik. He was recalled because he is a criminal creep and an advocate of pay to play – just like the Clintons. I don’t know that much changed after the recall. The district has passed two bad bond measures and they used bond money to build a new HQ and to build a warehouse. The board has completely failed with their Superintendent hires, repeatedly. The last guy used the SAUSD to pump up his pension then arranged for a free trip to China on the way out. C’mon, Art. Each candidate has their own campaign materials and I think you know that. Ultimately, I am sure you understand that a candidate still has to do everything in their power to get themselves elected using the campaign funds donated to their own campaign. 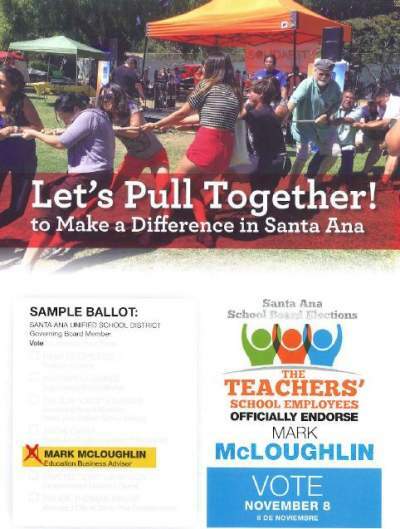 SAEA and CSEA created materials for our endorsed team and it was never an understanding that each individual candidate would use their own campaign funds to campaign for the other two candidates on the team. Alfonso Alvarez hits the streets nearly everyday with his own individual campaign materials. You just have decided to pick on one candidate on our team because you don’t like him. I don’t think that Rigo or Alfonso would have sent out a mailer like this. It is one thing to have a walk piece touting your campaign it is quite another to tell the voters to ONLY vote for you when you are part of a slate. It is pretty lame.